"We are about five Einsteins away from explaining the universe's existence." Martin Amis, English novelist and author of Einstein's Monsters and Heavy Water. In the image above, NASA's Hubble Space Telescope has picked up the faint, ghostly glow of stars ejected from ancient galaxies that were gravitationally ripped apart several billion years ago. 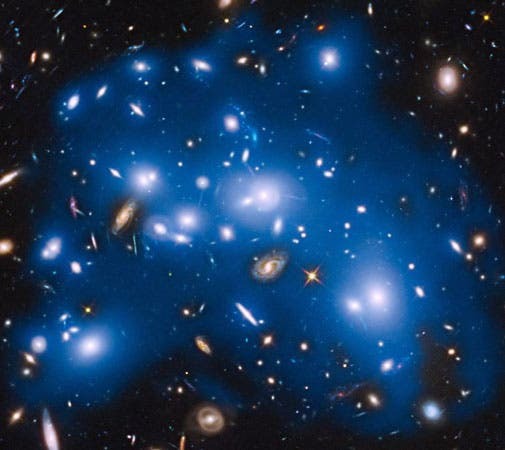 The event happened 4 billion light-years away, inside an immense collection of nearly 500 galaxies nicknamed "Pandora's Cluster," also known as Abell 2744. New Laser-Light Source "Opens a Window on the Microcosmos"